Spiny lobsters are marine invertebrates that are found throughout the world. These clawless lobsters belong to the Palinuridae family and are best characterized by their two long antennae. Many arthropods are able to generate sounds by rubbing two hard parts of their exoskeleton together, in a fashion similar to dragging a stick across a wooden fence. 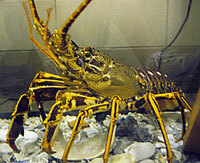 Spiny lobsters employ a slightly different technique to produce sound. These animals rub a piece of soft tissue called the plectrum against a smooth, stiff file that is near their eye. The plectrum “sticks and slips” against the file and produces a rasping sound. This technique resembles a bow moving over the strings of a violin. The sound produced is maybe used for protection against predators. By not relying on a hard exoskeleton to produce sounds, spiny lobsters are perhaps better able to protect themselves when they are most vulnerable after molting.